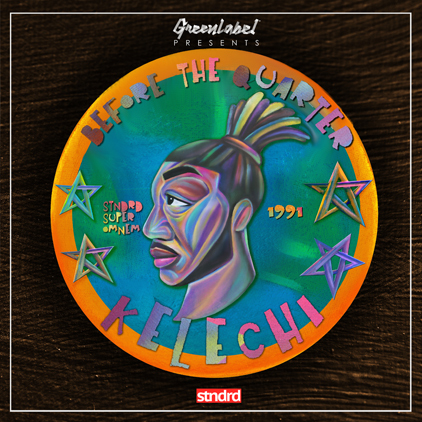 Last year, the Green Label Sound: Open Call contest sought out the next big thing in music, and after sorting through tons of impressive entries, GL eventually dubbed Atlanta rapper Kelechi the winner. Now, he’s about to drop a Green Label-produced music video for his song “Reachin'” featuring Trinidad James, and is gearing up to release his highly anticipated album Before the Quarter. While the “Reachin'” video was inspired by Ernie Barnes’s famous painting Sugar Shack (which you may recognize from the cover of Marvin Gaye’s I Want You album or Lil B’s I’m Gay [I’m Happy]), we had to get the scoop on the origins of Kelechi’s colorful, neo-mannerist album artwork. We hopped on the phone with Kelechi and the designer behind the cover, Yesterdaynite, to hear the Cover Story. going to be doing Quarter Life Crisis, we talked about the concept and both identified on a personal level with it. We’re both around the same age and we talked about being at the stage in our lives where we don’t really know what we’re doing but we’re trying to figure it out. From there, we talked about textures and colors and eventually created the final cover. What were the conversations like around the original ideas for the album cover? Yesterdaynite: It was all his idea. I’m just the outlet. I made whatever he told me he needed. I liked the music and the message because like he said, we’re the same age, and what he’s going through with music is kind of what I’m going through with art. What about the message really resonated with you? Yesterdaynite: It’s this idea of the quarter-life crisis. I felt like when I turned 25 everything was going to be awesome, and that I’d be living in a mansion, but the whole ‘adult’ thing is a lie. You turn 25 and you realize that you still look like you’re 20, or 18, and you’re going through some of the same struggles with girls and stuff. It’s like, what’s going on? I gotta get this together right now or I don’t know what’s going to happen! So I understand that feeling. Kelechi: The album changing is almost in line with the idea of personal change. It changed from Quarter Life Crisis to Before the Quarter, and that was something we had to adapt to. At least for me, things change very quickly and often. What I have going on changes, how I have to move changes, money situations, things like that. I know your music video for Reachin’ was inspired by a painting by Ernie Barnes called Sugar Shack. Was the album cover inspired by any artworks? Kelechi: The visual inspiration was all on Yesterdaynite. He was going through a period of using colors and textures in his signature way, so we kept with that. I do like art, especially since visual things can express sound in a whole new way, and this cover looks like how the music on this project sounds. What was the most memorable part of the process? Yesterdaynite: Our conversations about hip-hop were great. I’m a visual artist, but I also don’t know that much about art, and I don’t want to know. Hip-hop is my inspiration behind creating. I approach art like I’m a rapper. I want to be the Andre 3000 of art. Kelechi: And I think that’s really where we see eye-to-eye. That’s the dope thing about how we bounce off each other: it didn’t feel like I was communicating to an artist of another medium. It felt like I was talking to another rapper. It made things much easier, since we speak the same language.